As of late, GE Digital has been frequently featured on this blog for the advances it has made with the Predix platform (not to mention its entertaining Olympics commercials). However, this post and our most recent briefing was not for Predix, but rather the next generation of one of its legacy products – HMI/SCADA. On August 4, 2016 Matthew Wells, GM Automation Software GE Digital briefed the LNS Research team on the coming launch of the Next-Gen HMI/SCADA launch coming from GE Digital. Next-Gen HMI/SCADA from GE is squarely focused on redefining the role of the operator and the nature of work on the plant floor. It is not surprising such a bold ambition is being put forth by a company like GE. For years, LNS Research has advocated for industrial companies to think more like tech companies and for Continuous Improvement processes in manufacturing to look more like Innovation processes at tech companies. GE has been at the forefront of making this a reality, with the deployment of its FastWorks, which essentially evolves traditional Lean and Six Sigma to incorporate newer Agile Development and Lean Start Up methodologies. But what exactly does it mean to redefine work? The company has put a lot of time and effort into refreshing the user interface and implementing new best practices as prescribed in the new ISA101 HMI standard. It has also done extensive UI testing to change the way information is presented and essentially is adopting a less is more approach. Rather than overloading HMI screens with fancy graphics and animations, only essential information is presented and that information is presented in a dashboard style. Individuals can still drill down to process flows if needed, but it isn’t the main interface. GE claims this approach improves reaction time, reduces errors, and reduces fatigue. Reimagining work also means increasing the use of mobile and collaboration capabilities where it makes sense. This will immediately impact mobile plant workers, maintenance, electricians, engineers, supervisors, etc. by providing them more information in an easily consumable fashion. This will be without constantly needing to go back and forth to terminals or tag-team trouble-shooting efforts that could be done with a single person if the HMI was just at the fingertips of the person who needed it, where they needed it. Overall, at first look GE’s attempt to redefine the nature of work through Next-Gen HMI/SCADA looks solid and comprehensive. The only potential gap we see is around using proximity of users to control security and access. Although some customers have done this relatively easily on a one-off basis, hopefully GE will be able to add this to the standard product in the future. These capabilities will become even more of an issue as Cloud becomes a bigger part of the HMI/SCADA story. Although the biggest push has been on the use of HMI/SCADA, GE has not forgotten the needs of System Integrators. As part of the Next-Gen offering, GE is putting in the architecture to support hybrid on-premise / Cloud implementations. In the early days, a hybrid deployment approach will enable implementers to more easily re-use engineering content and deploy global roll-outs across the enterprise in a standardized way. Over time, as industrial companies become more comfortable with the Cloud, benefits will extend beyond engineering to operations. This will include, but not be limited to, global visibility, remote control, and enterprise level analytics. Although industrial companies today are not ready to wholesale move control applications like HMI/SCADA to the Cloud, many are ready to start thinking about a hybrid model. Of course, this begs the question, will Next-Gen HMI/SCADA run on Predix? It appears GE is taking a very pragmatic approach, rather than forcing all applications on the Predix platform as soon as possible. They will keep pace and even push the boundaries of customer expectations. To that end, Next-Gen HMI/SCADA will not be on Predix platform to start, but is being built with an architecture to enablement movement onto the Predix roadmap in the future. The coordination of the roadmap for mature applications, like MES and HMI/SCADA with the roadmap for Predix apps, has previously been an area of concern for both customers and LNS Research. GE Digital is both aware of the concern and has reached out to both LNS Research and customers over the past several months to alleviate the concerns by presenting a clear path forward. In regards to MES applications, there will be an overlap of capabilities. For example, there are already both Predix and mature MES applications for OEE. In the case of HMI/SCADA, this issue of overlapping capabilities will be a non-issue, which makes us all less prone to confusion. 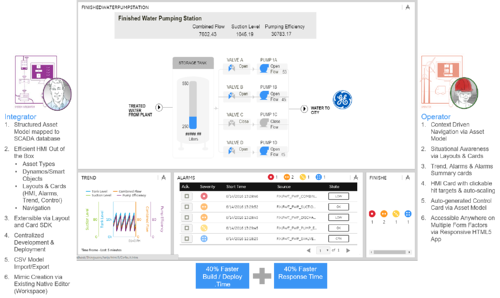 However, GE is still aware of the potential for confusion and is proactively reaching out to customers to coordinate plans and roadmaps for the movement of HMI/SCADA onto Predix. Although GE Digital is a company that is working to change the traditional software market dynamics with the launch of the Predix platform, it has not abandoned its traditional automation business. The launch of Next-Gen HMI/SCADA is the clearest example of GE’s continued focus on pushing mature offerings forward. LNS Research believes this new version is keeping pace with top competitors and, in some of the key areas discussed in this post, pushing the entire industry forward.